This great-looking color scheme is one of two that are new for a few Maverick X3 models. All of the X3s now have the Smart-Loc front differential that was limited to the X3 rc rock crawler in 2018. 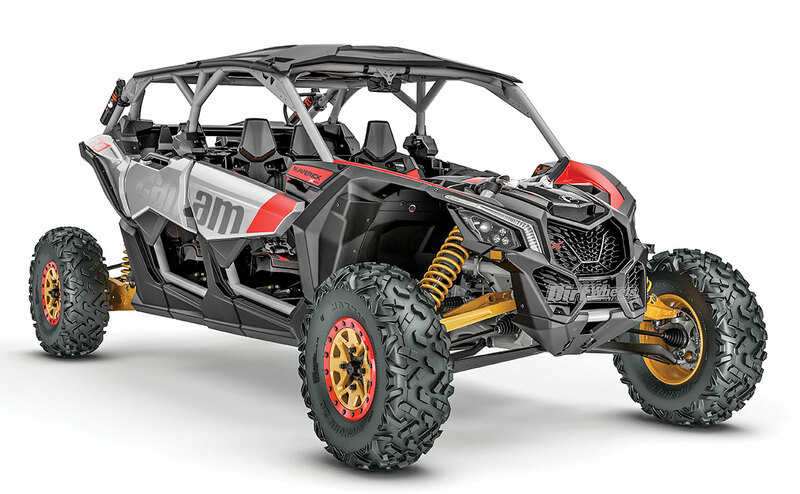 After spending the last few years making sure that the Can-Am Maverick X3 line was making life rough for its sport UTV competitors, the 2019 Can-Am line-up has refinements for UTVs but is heavy on upgrades for the company’s extensive line of ATVs. In addition to upgrades in suspension, two of the most popular quads are actually cheaper than they were in 2018. Apparently, Can-Am likes being able to say that the 172-horsepower X3 Turbo R lineup is the most powerful available production UTV. For 2019 it upped the majority of the 1000cc quad models from 82 horsepower to 91, which, if you follow the direction of the company, makes the Outlander and Renegade quads the most powerful production ATVs built. We suspect there will be further 2019 announcements to come. There is no information here on the new Maverick Sport and no mention of the non-X3 Maverick lineup. 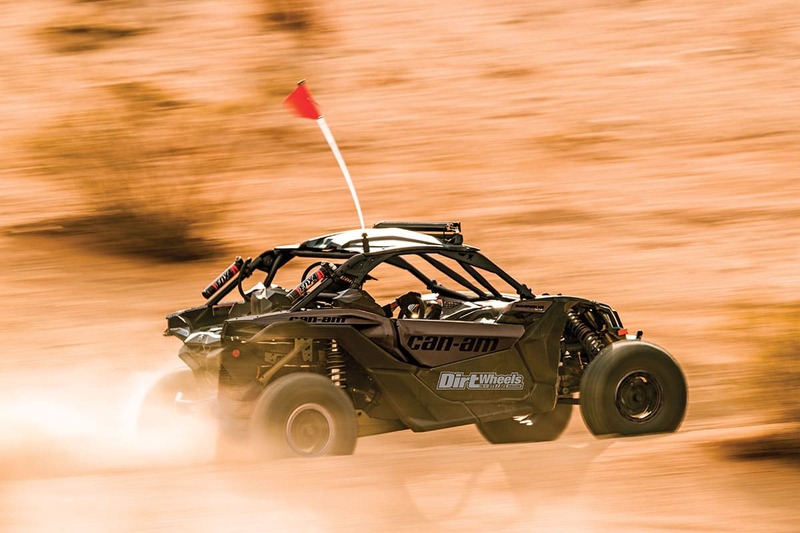 At the pinnacle of Can-Am’s sport UTVs is the Maverick X3 X rs Turbo R. It gained the Smart-Loc differential and revisions to the front sway bar for 2019. It is 72 inches wide with 24 inches of rear travel. The high-performance Maverick X3 and Maverick X3 Max X-package super-sport side-by-sides all receive Smart-Lok, a fully lockable on-the-fly front differential with electronically controlled automatic modes for maximum traction and precision cornering. Smart-Loc was introduced to acclaim on the 2018 X3 RC rock-crawling models, and it makes perfect sense to upgrade all the various X3 models. All X3 side-by-side vehicles get a new high-torque, Tri-Mode Dynamic Power Steering (DPS) system claimed to improve low-speed driving and improve steering feedback to the driver. Can-Am redesigned the front sway bar link to be more durable, which also enhances cornering. A new electrical cover better protects the engine control unit (ECU). Phoenix Orange joins the Can-Am color palette. It is available for the Maverick X3 X ds and the Maverick X3 Max X ds. There is also a striking gold, Can-Am Red and Hyper Silver combination for the Maverick X3 X rs and Maverick X3 Max X rs. 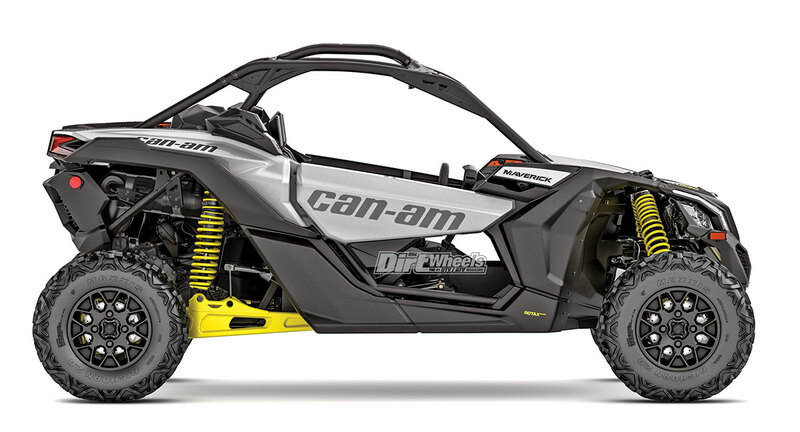 As a base-model sport ATV, Can-Am has the Maverick X3 Turbo. It saves money by foregoing an intercooler. It has 120 horsepower, but it is a very pleasant machine to drive. The only Maverick models mentioned in this first Can-Am release are the five 50-inch Maverick Trail 800 and 1000 models. No changes are listed, but we do know that 60-inch Maverick Sport models will be added to the line. The Sport should be a nimble and accomplished trail unit. Every Defender with the HD8 or HD10 engine is now rated to tow a whopping 2500 pounds! That puts them on par with any CVT UTV in the industry. Though the tough Defender line is the most utility of all Can-Am offerings, it is also considered part of Can-Am’s Ute-rec offerings. Many full utility machines are used for fishing, hunting, sightseeing, camping and other outdoor recreation activities, so they may never see a farm, ranch or building site. Changes for the Defender family include the addition of a 2500-pound tow rating for units with the HD8 and HD10 engines. That puts them on par with the radically redesigned Polaris Ranger 1000. Another addition is a welcome one-year limited warranty on all 2019 Defenders sold in the USA and Canada. The Defender HD8 now has a standard lockable rear differential system and 27-inch Maxxis Bighorn 2.0 tires. Defender XT Cab and Max XT Cab vehicles get a welcome 12 inches of ground clearance to facilitate overcoming demanding obstacles. The specialized, mud-ready Defender X mr is fortified with the class’s top ground clearance at 15 inches and a new larger shock bore. Engineering revisions reduced the gearing for both the high and low range, while a new lockable rear differential system with eight total selective modes makes the specialty X mr even more capable in and out of the mud. The system is even calibrated to prevent turf tearing. The Defender XT-P package now features the Smart-Lok traction system with Trail mode for maximum footing in every condition but especially in slow-speed maneuvering. The Defender Lone Star Edition receives its own prominent badging, improved cast-aluminum wheels and, like the Defender Mossy Oak Hunting Edition package, tougher protective equipment for more resilience in challenging terrain. The Defender Cab models feature an integrated heater system for the full-cab enclosure from the factory. It includes a full glass windshield, wiper/washer kit, full doors with front electric windows and hinged rear windows, a hard roof with liner, an interior dome light and a sliding rear glass window. 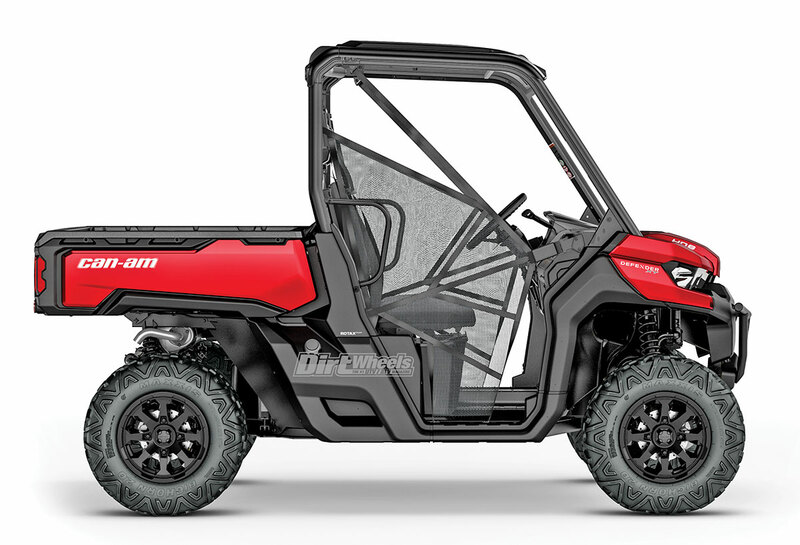 Can-Am’s Commander line has two-seat and Max four-seat models in XT and Limited trim levels. The Commander was one of the original sport-rec UTVs available. The Commander recreation-utility line fills a spot between the Maverick line and the utility-oriented Defender line. The step up from a pure utility machine to the Commander is a significant one. The Commander can work, but it has a definite sporting, camping and hunting bent. The Commander two-seat and Max 1000R jumped up to 92 horsepower in 2018, thanks to getting the Rotax V-twin 1000R engine, transmission and air intake system from the Can-Am Maverick 1000R. It also got a wider stance, larger brakes and 14-inch cast-aluminum wheels. With all the changes in 2018, Can-Am specified no changes to the Commander 800 or 1000 XT or Limited for 2019. It feels like Can-Am’s ATV line is almost limitless! By far the largest numbers are found in the Outlander 4×4 line, but there are also the sporty Renegades, youth models and a surprising number of 6x6s. Can-Am has a dizzying array of ATVs for any imaginable purpose. There are youth, performance 4×4, and sport 4x4s bolstered with special hunting, winter and mud-specific models. There are even super-capable 6×6 ATVs. The Outlander and Renegade models all get a new look for 2019. This restyle includes a new front grille that takes cues from the Maverick X3 side-by-side vehicle family, fresh aluminum bumper corners, specific wheel packages and the addition of mud guards. Also, the Can-Am ATV family welcomes a total of eight new color offerings for 2018. One of the most impressive of Can-Am’s Outlanders is the X xc 1000R—a true crossover-type sport-rec performance 4×4 ATV. Along with the newly revised 91-horsepower Rotax 1000R liquid-cooled V-twin engine, it has new Torsional Trailing arm Independent (TTI) rear suspension. The new TTI rear suspension is designed to eliminate scrub and camber changes when the suspension works up and down, and keeps the quad in a straight line. The rear suspension also has motion-control shocks and offers 9.9 inches of travel. The X xc includes a removable external sway bar and lower pivot points for geometric squatting to improve traction and power transfer. While the rear suspension is designed to reduce wheel scrub, the front is aimed at greater clearance. The front end gets a look related to the popular Maverick X3 sport UTV. Up front there is a new arched double-A-arm front suspension with dive-control geometry, 9.2 inches of travel and an integrated sway bar to improve handling while maintaining comfort. Fox Podium 1.5 RC2 shocks with adjustments for rebound and compression control the new suspension. For transferring its impressive power to the ground, the X xc gets 14-inch beadlock wheels with ITP Terra Cross tires. With separate front and rear hand-brake controls, aluminum pre-runner front bumper and a full skid plate, this Can-Am is ready for duty. 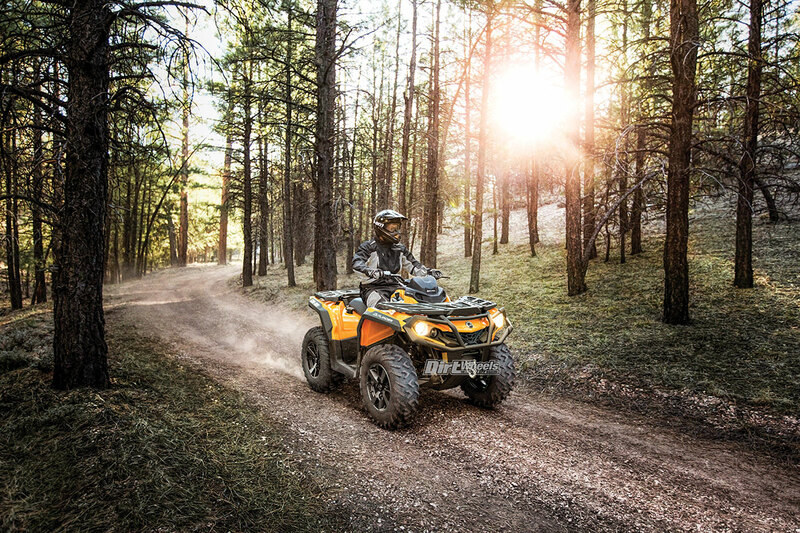 The new Can-Am Outlander ATVs with the 91-horsepower Rotax V-twin engine feature intelligent Throttle Control (iTC) and three operating modes (standard, sport and work) to provide smooth throttle delivery for recreational endeavors, work, and when hauling loads and riding with passengers (only on Max models). Sport mode supplies max power, torque and response, while the other modes (standard and work) are designed to smooth throttle control in working situations or while navigating challenging terrain with a passenger. The Outlander X xc 1000R offers the industry’s most capable towing capacity at 1650 pounds via a standard 2-inch receiver hitch. 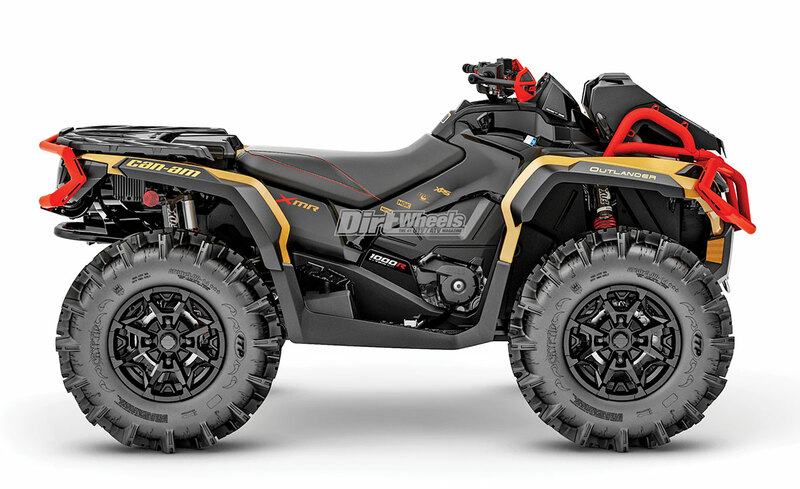 Can-Am put great effort into ATVs for 2019. Both the front and rear suspension are redesigned, the front end has a new look, and many models gain 14-inch wheels and mudguards added to the fenders. Both the Outlander 650 and 850 ATVs received the same family updates but now are easier to own. The 650 retails for $8399 ($400 less than 2018) and the 850 is $8999 ($750 less than 2018) in the USA. Joining the 1000R are winter-equipped special Outlander North Editions powered by either a Rotax V-twin 650 or Rotax V-twin 850 engine. 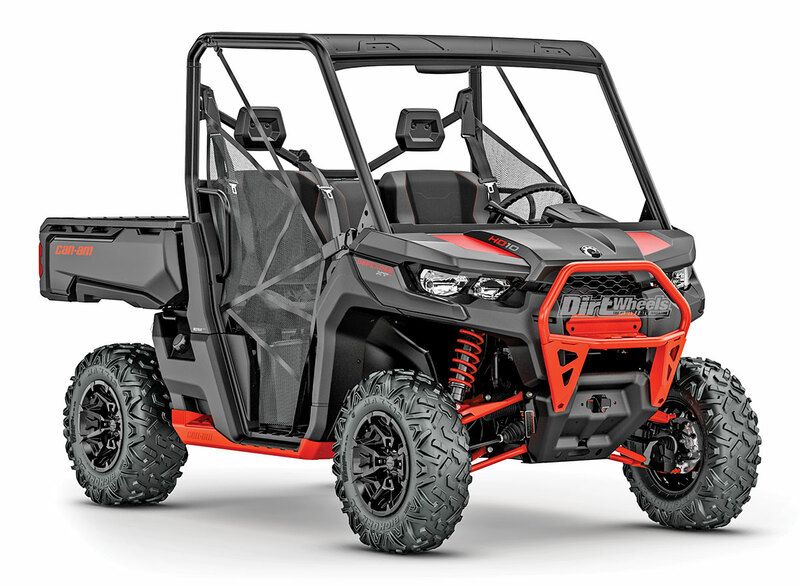 North Edition ATVs are available in one-up and Max (two-up) platforms, and they include a full windshield, mud guards, heated grips, heated throttle, and visor outlets for driver and passenger (Max package only). For work, the North Edition has an extra-low low range for plowing snow and includes a 3000-pound Warn winch. New ITP Terra Cross tires on 14-inch aluminum wheels ensure ample traction. The package includes Tri-Mode Dynamic Power Steering. 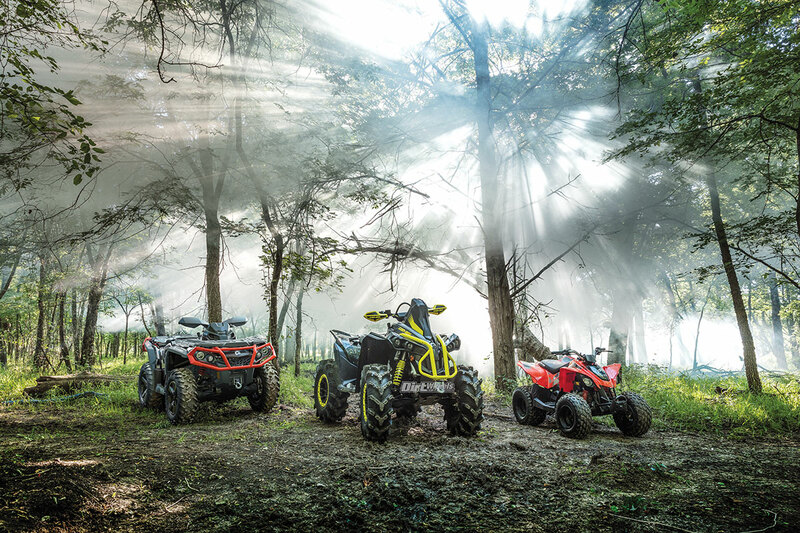 Can-Am offers 4×4 quads in 450, 570, 650, 850 and 1000cc. 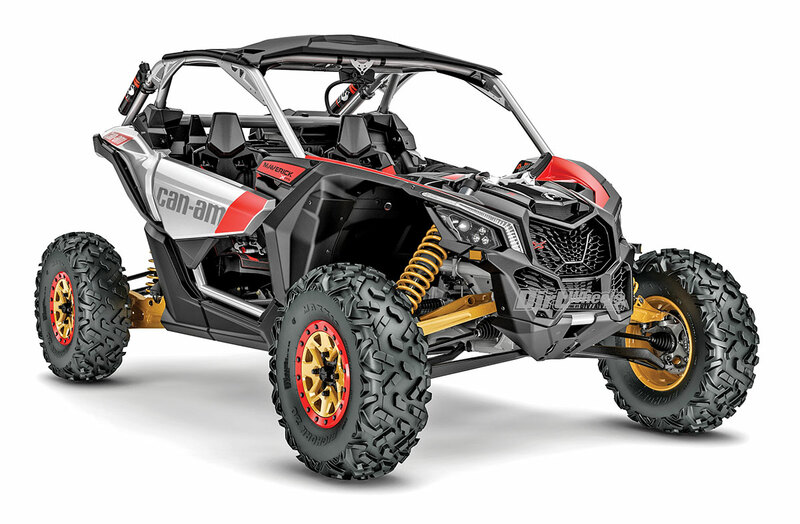 Can-Am’s Outlander line was already strong, but the fresh look to the front end and the suspension changes will only make it more competitive in the 4×4 field. 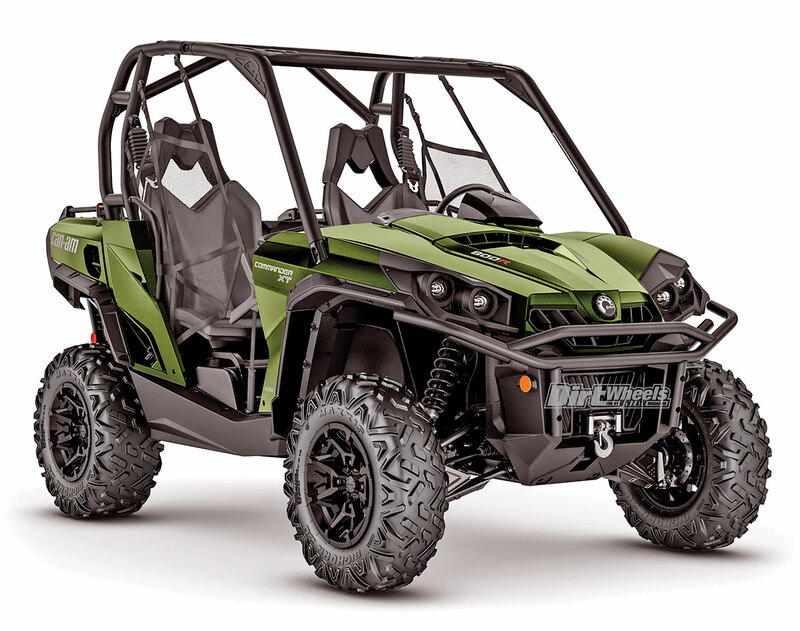 The Outlander Max 6×6 ATV family now includes many of the 2019 Can-Am ATV family updates, including the new suspension and enhanced stability, as well as a longer 90-inch wheelbase for ample comfort and control. A new removable passenger seat (Max configuration) allows for instantaneous and convertible two-up/one-up seating. 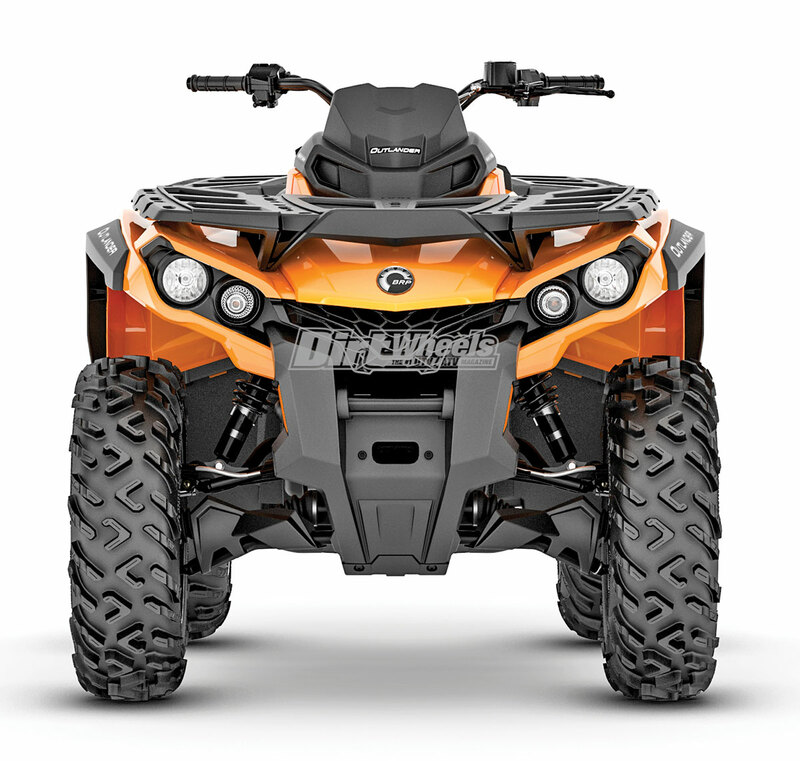 Can-Am offers a diverse two-up ATV family with multiple packages: base (450/570); DPS (450/570/650); XT (570/650/850/1000R); XT-P (850/1000R); North Edition ATVs (650/850); and Limited (1000R). The Defender HD8 now has a lockable rear differential and sporty, premium 27-inch Maxxis Bighorn 2.0 tires. All of the Defenders get a welcome one-year limited warranty in the U.S. and Canada. The Renegade is Can-Am’s sport 4×4 quad. This line gains the new suspension upgrades. The standard Renegade comes in 570/850/1000R. There is a better-equipped X xc in both 850 and 1000, and there is the mud-oriented X mr in 570 and 1000R.